Original XJ13 – Would it have been competitive? How did the competition look? In the spring of 1963, Ford heard that Enzo Ferrari was interested in selling his company to Ford. Ford committed millions of dollars researching and auditing Ferrari’s company only to have Ferrari unilaterally withdraw from talks at a late stage. This angered Henry Ford II who directed his racing division to find a company that could help them build a Ferrari-beater on the world endurance-racing circuit. The Ferrari-beater turned out to be the GT40 which, although American-built, was based on a collaboration between Ford and England’s Lola. Ford did not, at this time, have the racing prowess to take on the likes of Ferrari so had earlier engaged in discussions with England’s Lotus, Cooper and Lola – eventually choosing the latter as a partner. The first GT40s raced in 1964 and 1965 with no great success. In 1966 however the 7-litre Mk II absolutely dominated the 24 Hours of Le Mans race with a 1-2-3 result – shades of the Jaguar victories in the 1950s. This dominance continued in 1967 with a win by the Mk IV version of the car. The Lucas Mechanical Fuel-injected 1966 Ferrari 330 P3 used a rather fragile transmission that was later replaced by a ZF. Jaguar’s design included Lucas Mechanical Fuel Injection and the more robust ZF DS25-1 transmission from the outset. In 1967 the P3 became the P4. The latter car finished 2nd and 3rd at Le Mans in 1967 behind the winning Ford GT40 Mark IV. How would the XJ13 have fared against the mighty GT40 in 1967 ? Project delays and lack of commitment by Jaguar meant things got off to a slow start and the car wasn’t completed until 1966. Sadly, the car’s main opportunity to shine at Le Mans may have been missed. Although Jaguar’s rebuilt “original” will probably never race, my recreation perhaps could. However, even though I can recreate a car with similar power and identical handling characteristics to the 1966 original, it would probably be humbled by a GT40 if it lined up against it on a track today. The reason being that, since 1967, original GT40s have undergone continuing race development and are probably now achieving levels of handling and performance far in excess of those achieved in 1967. The Jaguar XJ13 hasn’t enjoyed the best part of 50 years continuous development and would likely be embarrassed if placed on a track alongside an original GT40 today. This would definitely be true of Jaguar’s one-and-only rebuilt “original” which has led a sheltered life punctuated only by the odd low-speed excursion and short run over the last 40 years since it was rebuilt as a “demo queen”. In performance terms, the engine powering the “original” is only a shadow of its former self and would likely struggle to maintain any sort of pace. Sadly, and as I write this, the “original” has barely turned a wheel in six months. Following the quite-unbelievable closure of the Jaguar Heritage Museum in 2012, the car has been sitting motionless as part of a small Jaguar Heritage display at the Heritage Motor Centre at Gaydon, Warwickshire UK (From 3min 17secs in the first video). As a lasting homage to the genius of its late designer Malcolm Sayer the car does continue to inspire with its superb lines but is likely to remain as no more than that. We can at least examine the many contemporary records and reports that have recently come to light and can look at the XJ13 as it appeared in 1967. We are fortunate in being able to re-live events through things such as the detailed development and testing reports recorded at the time. 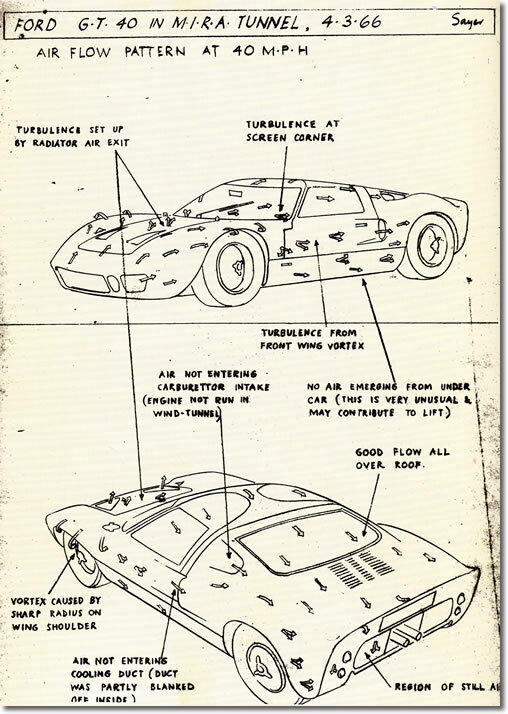 The XJ13 Project Manager, Mike Kimberley fortunately recorded events in detail through his meticulous test reports and worklists that were prompted by post-test analysis. A then-current GT40 was acquired by Jaguar’s Competition Department in 1966 and the results of their findings were also recorded. Readers of this blog will know of my intention to not only recreate the XJ13 exactly as it was in 1966 but also to eventually see it on a racetrack. I am taking great (some would say “obsessive” ) care to remain true to original suspension design/location so that my recreation should perform similarly to the 1966 original. The finished product may give us additional insight into how the original may have fared in competition. Watch this space! By the middle of February 1966, the XJ13 was nearing completion. With all eyes on the likely competition at Le Mans in 1967, “Lofty” England (Jaguar’s racing team manager) succeeded in borrowing a Ford GT40 from Ford Advance Vehicles. It was duly delivered to the Competition Department where it was subjected to a detailed analysis. Mike Kimberley, Derrick White and Malcolm Sayer were very much involved in this analysis of the “competition” and participated in its stripdown, measurement and analysis. Someone else also involved in this analysis was Peter Wilson – author of the definitive work on the XJ13, “XJ13 – The Definitive Story of the Jaguar Le Mans Car and the V12 Engine that Powered it“. The car Lofty borrowed wasn’t a racer but a road-going version powered by a 4.7 litre wet-sump engine. Has this car survived? Perhaps any GT40 enthusiasts could please let me know? The car was taken to MIRA on 4th March 1966 by Mike Kimberley & Norman Dewis and the car was put through its paces. Testing wasn’t particularly extensive as the car wasn’t a full race version – in any case, time was running short! Despite being a “road car”, the general handling characteristics were very good and the car was responsive with sensitive and positive steering. There was low-speed understeer which only changed to oversteer at maximum power. The car was very susceptible to being blown off course in conditions of changing wind direction – requiring correction to maintain course. Maximum cornering force was just less than 1G. Whilst smooth, even braking could be achieved, it was not possible to lock the wheels. The pads hadn’t been fully warmed for these tests however. The maximum lap speed was found to be 133mph which compared poorly with the D-Type’s 155mph – highlighting the “road-car” spec of this GT40. Even though the car was et up for the road, ride refinement was lacking with a hard ride and “kicks” from the steering. Static geometry checks showed the car had been quite badly set up with a 1″ difference in track front-to-rear (both should have been 54″). The gearchange for the DS25-1 transaxle was found to be light and easy to use (as was the case with the XJ13). I’ll let you know in due course! Pedal spacing was ideal and made “heeling-and-toeing” very easy. The accelerator pedal was a pendant type wheras the XJ13’s was organ type. After the driving tests, the car was taken into the MIRA wind-tunnel and Malcolm Sayer was able to examine the car’s airflow characteristics in some detail. Sayer noted differences between the car and its racing version including blanking-off of brake ducts and side-cooling ducts. He also noted the rear spoiler was a good 4″ shorter than the 1965 car and the car didn’t have the lift-reduction deflector plates which would have increased drag. Although drag for the road-car was lower than the 1962 E-Type and 1962 Ferrari Berlinetta, it was significantly worse than the 1955 racing D-Type. Aerodynamic lift did seem to be an issue and it was interesting to note that “reliable sources” stated Ford were suffering with excessive lift on their racing versions. These “reliable sources” may have been from MIRA who were carrying out secret air-studies for Ford at the time. The XJ13’s main test driver was David Hobbs. Although Jaguar already had a competent driver in the shape of Norman Dewis, William Heynes recognised as early as 1964 that a car such as the XJ13 really needed a top-flight race driver to help develop it. There is some evidence to suggest that Jack Brabham had been approached in this respect but, in the end a former Jaguar apprentice – David Hobbs – was recruited for testing. In 1969 Hobbs was included in a FIA list of graded drivers which was an élite group of 27 who were rated the best in the world. It was Hobbs who achieved the unofficial UK closed lap record with the XJ13 which stood for the next 32 years. The XJ13’s main test and development driver, Hobbs, was joined at Silverstone for the XJ13’s final test at full racing speed by another top-flight racing driver (and ex-Jaguar apprentice) Richard (“Dickie”) Attwood (a Le Mans winner and the subject of a recent “Motorsport Magazine” podcast). On the morning of Tuesday, 15th August, the XJ13 was taken to Silverstone amidst great secrecy. Mike Kimberley planned for David Hobbs to drive all that day for comprehensive testing under full racing conditions. They wanted to see what the XJ13 could do! Unfortunately, rain began to fall (this was an English Summer after all) and testing was curtailed early on. Conditions looked better the next morning and David Hobbs was joined by Richard Attwood. Although drying, the track was still wet in places and the XJ13 gingerly took to the track. Conditions continued to improve although a shower did interrupt proceedings for two hours and some dampness did remain at the end of testing. Hobbs and Attwood managed a full five hours of testing – although they had to seek shelter for two hours during the shower. Hobbs did outperform Attwood. Mike Kimberley later described Hobbs as “a fearless driver” who clearly drove with maximum commitment. Hobbs had also carried out the lions’ share of testing and so was very familiar with the car already. His best time was a respectable 1 minute 35.7 seconds – this on a drying track with a lingering damp patch at Beckets. A time comparable to Attwood’s previous best time in a Ferrari LM of 1 minute 35 seconds – the same time as the best time for a GT40 in the hands of P. Hawkins (1 minute 35 seconds). The test at Silverstone was to be the final outing for the XJ13. It was never to race and only emerged when required to play a supporting role in a promotional film in 1971 for the soon-to-be-launched Series 3 V12 E-Type. It crashed and was rebuilt in 1972/73 in a specification more suited to its role as “demo” vehicle. It has now been established that the crash was caused by the failure of a rear tyre that had been plugged to cure a slow leak – Norman Dewis having ignored instructions not to drive at racing speeds for the camera. Would the XJ13 have been competitive at Le Mans? The above, conservative, estimates would have resulted in a Silverstone lap time in the region of 1 minute 30 seconds. A full five seconds faster than the best lap time achieved by P Hawkins before 1967 and coincidentally, similar to Hobbs’ best lap time in a BRM V8 F1 car at the British Grand Prix in 1967 at Silverstone. The XJ13 was designed in 1964 by a small team of people under Bill Heynes – Malcolm Sayer, Derrick White and Alex Frick. At the same time, they were working on a number of actively-campaigned E-Types. This team was incredibly small considering their workload (even Connaught had a design staff of 8 in 1955!). In 1964 they settled on a monocoque design using Baily’s quad-cam V12 as a fully-stressed member – like the D- and E-Types before it, a more sophisticated and advanced design than its contemporaries. By the end of 1964 they had settled on the basic layout of the rear suspension. In essence, similar to the E-Type with a lower wishbones and a fixed-length driveshaft acting as upper link. White, argued for a transverse upper suspension link coupled with a sliding driveshaft. This would have ensured greater accuracy in controlling rear wheel geometry when faced by the demands of tyres rapidly growing in width at the time. His wishes were constantly rejected by William Heynes. Derrick White also designed a series of completely novel state-of-the-art front suspension setups. Heynes, it seems, from the outset wanted to adopt an E-Type based setup. Each of White’s designs were rejected by Heynes in turn. He also became increasingly frustrated at Heynes’ lack of progress and stubborn attitude. In the end White became royally pi**ed off with all this and left Jaguar to join Cooper. Shortly after joining Cooper (and having been given free reign to design a car in the way he felt it should be designed) his Cooper-Maserati became a front-runner in the 1966 F1 season then won the first race of the 1967 season. He later joined the Honda/Lola/Surtees consortium and helped design the “Hondola” wich won first time out in 1967. It is a shame he was prevented from exercising his talents on the XJ13 as well as the lack of urgency throughout 1965 as Ford may really have been humbled by the XJ13.